If there was one British practice that we should have retained before ousting them from our shores centuries ago, it surely is afternoon tea. I can’t think of a better way to spend the hazy hours between lunch and dinner than indulging in warm tea with clotted cream-slathered scones. As much as I adore the practice, I’ve only been to tea exactly two times in my life. 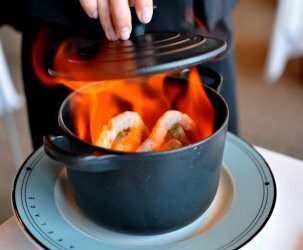 On both occasions I was in a fancy hotel in Saigon [See: Caravelle and Park Hyatt] and on both occasions I missed out on crumpets. Sure, there were dainty finger sandwiches and adorable petit fours, but sadly, not a single crumpet graced my three-tiered towers. I finally had the pleasure of tasting a coveted crumpet while in Seattle. 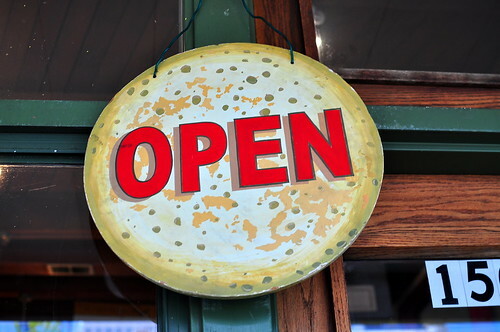 Opened in 1976 by Gary Lasater and Nancy McFaul, The Crumpet Shop has become a city institution. While crumpets aren’t traditionally eaten for breakfast, The Astronomer, Rosalind, and I thought they’d be perfectly pleasant in the morning. We snagged a table near the kitchen, granting us the opportunity to spy on the unknowing chap performing his crumpet making duties. Crumpets are the result of a simple yeast batter meeting a hot griddle and circular molds. The spilled-over batter is scraped off to create a neat disc. The surface is spongy and porous, which allows butter and jam to seep into every little hole. The texture is similar to an English muffin, but a bit doughier and more substantial. 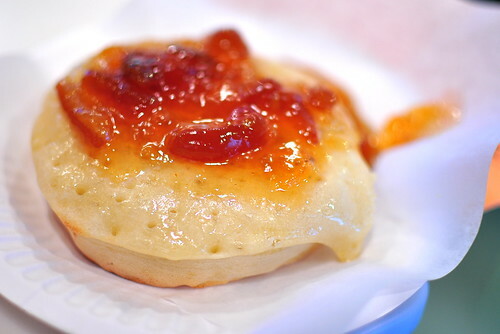 On our first visit to The Crumpet Shop, we shared two crumpets with butter and fresh preserves ($1.95). Each one was toasted to order and buttered up nicely. The marmalade was full of zesty bits and bitter enough to remind us that we were eating a whole orange with a bit of sugar rather than the opposite. 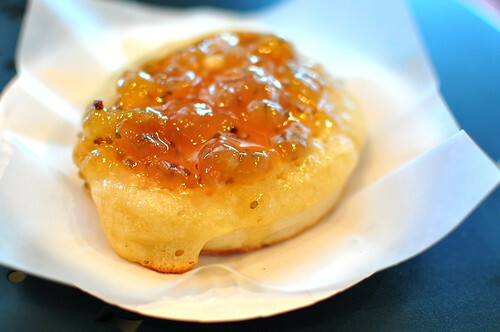 The gooseberry jam offered two firsts in one bite—my first crumpet and my first gooseberry! Taste-wise, the jam was better balanced than the marmalade. The Astronomer and I returned to The Crumpet Shop a few days later for an afternoon snack. 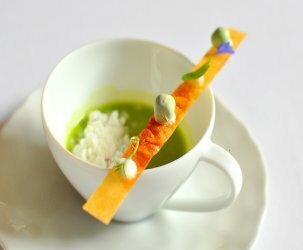 This time around, we sampled a savory one. 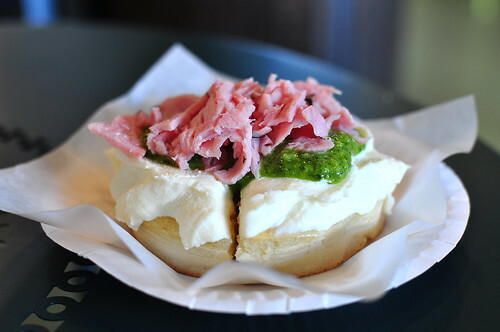 The warm crumpet came topped with a thick spread of ricotta cheese, house-made pesto, and shredded ham ($4). The highlight was the subtle and creamy ricotta. I don’t think I’ve ever been so taken by ricotta cheese. I loved my crumpet experience so much that I purchased crumpet molds from Amazon as soon as I arrived home. I cannot wait to have afternoon tea in my apartment with fresh crumpets and jam served on the brand-new China from the wedding registry. Good times ahead. My wife introduced me to crumpets. But I don’t eat them with tea I kind of like them as breakfast item. 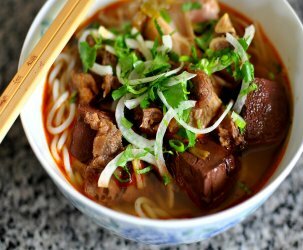 All your Seattle posts makes me want take the family there for an eating vacation! cute post. i’ve never heard of a savory crumpet before, but it sure does look good! 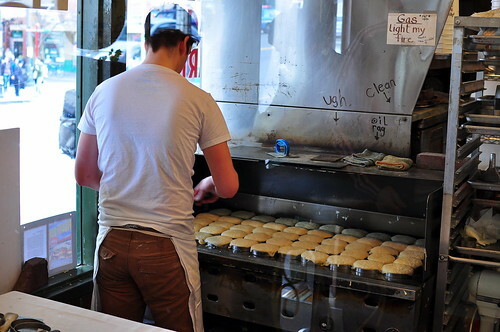 i’ve never had a crumpet but now you make me really want one…. Zomg. The closest I’ve gotten to a crumpet were the ones packaged in plastic at Trader Joe’s—these on the other hand are beautiful! Good stuff! I got this place bookmarked for my NW passage. Those look like some damn fine crumpets! I would never have thought of ham, pesto and ricotta. I’ve never had crumpets. They sound so good and so do the jams! I can’t wait to see how your crumpets turn out. I sort of wish I was British now. Pip pip cheerio! I’ve never known that crumpets were so versatile–like crepes. Interesting! The ham one looks really yummy.